East Somerville Main Streets, the business association for one of Somerville’s most vibrant and least wealthy neighborhoods, received a grant from the National Endowment for the Arts to do cultural placemaking through a series of outdoor performances and art projects. 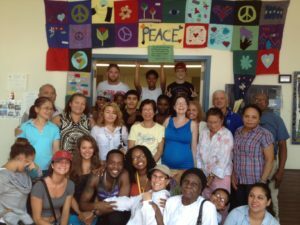 As part of the initaitve, Connection Lab led Teen Empowerment and the Somerville Council on Aging in creating a peace quilt to make a statement about the positive ways in which Somerville is reducing crime, becoming safer, and connecting people who were divided in the past. Quilt squares were designed by people from the neighborhood of all ages, races, ethnicities and genders. Each square shares a message or a symbol of peace. Project leaders then worked together to sew the squares into a quilt to flank the doorway of the city building that Teen Empowerment and the Council on Aging share.